Hello, i'm trying to use external tools to compile SASS into CSS, and i want SASS to watch my project directory. If I want this to work fine i need forward slashes in my path parameters, but macros allows me to insert only backslasehs. So, is there any way to change slashes direction? 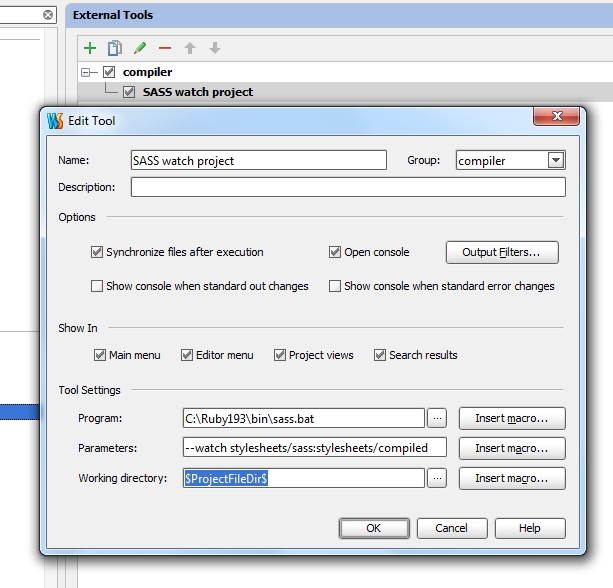 I assume you are using windows and set parameters to "--watch $ProjectFileDir$\sass:$ProjectFileDir$\compiled". You should set working directory to $ProjectFileDir$(see screenshot). FYI the latest EAP WebStorm 6 build includes new feauter called Background Tasks. WebStorm will suggest you adding predefined task for SASS files that compiles *.sass files into *.css on changes. You can check how it works for TypeScript in this post. Thanks for quick response, it worked for me great! I'm greatfull for your help.